This was the answer I prepared when my journalism lecturer asked in our first seminar this year why we had chosen his unit. It was an honest answer but I dreaded being chosen to answer. This was mainly due to the fact that I didn’t want to announce that I actually intended to follow a career on the other side – in PR. So why did I choose this unit? Ever since I was a small child I would write. In my pre-school years I would copy out children’s books and then as I became slightly older I would start to write my own little imaginative stories. I can vividly remember the sense of pride and satisfaction I felt as my parents read and praised my work. But it wasn’t just creative writing I attempted. In my final year of primary school I wrote and edited my very own magazine – my first taste of ‘journalism’. And to cut a long story short, the pattern continued throughout school and sixth form as I excelled in both English and Media Studies. As you can see through this blog and my work portfolio, I still enjoy writing and I believe that continuing and furthering your writing skills stands you in good stead for whichever career path you choose. For instance, PRO’s are often writing press releases and features to send to journalists or using social media platforms, such as blogs, to publicise their company. As well as in writing, I have a great interest in the media and its powerful influence on our lives. Being part of that in some way fills me with excitement. Whichever profession in the media you choose surely it makes sense to understand how they all work together? The journalism unit is vital in my final year of my degree not only to develop my writing skills but to compliment my other units: public relations, advertising and publishing. I would recommend Bournemouth University’s Communication and Media degree to anyone who has a general love for the media. No other degree would give you such a well-rounded understanding of the integrated professions and how they relate to each other. If I am to employ successful PR practice in the future I need to understand the role of the journalist in order to work beside them effectively. I need to be aware of their pressures and demands, instead of focussing purely on my own, to form a good working relationship with them. At the same time PR involves writing clear and concise press releases with newsworthy angles which will help save a busy journalist time. 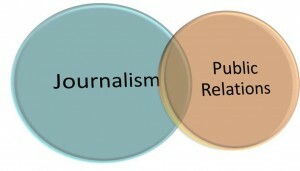 In my opinion, having a solid understanding of the role of a journalist is key and vice versa.